Okay. So you have studied the Be-1 webpage and now understand the soil food web concept and that healthy, rich-living soils promote healthy plants, but now what? Recapping, while the Be-1 pellets have a strong organic nutrient base with an OMRI-certified NPK of 3-6-5, this is secondary. 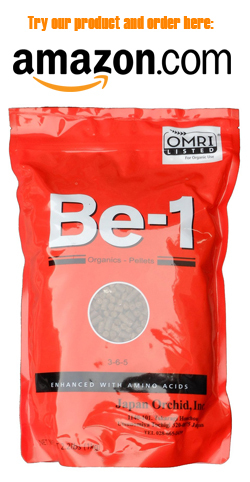 The unique benefit of Be-1 is its ability to increase your existing biology using amino acids, which have been selected to increase beneficial aerobic microbes that enhance plant growth to their natural potential. Containing 3% nitrogen that is mostly slow-release (1/3 soluble, 2/3 insoluble). You can try the smaller 1kg (2.2lb) bag for yourself and see what microbes can do, with assurance that the slow-release nitrogen means little risk of over-fertilizing and burning. Try Be-1 on a few plants throughout the growing season and use your usual feeding routine for the remainder and compare. Just remember, within a few days you will likely discover white fungi growing around the Be-1 pellets, especially if you are able to bury them a little into the soil. When you find them, please do not remove them, as they are beneficial and have a symbiotic relationship with your plants. ...But what if you want to attain the maximum natural growing potential for your particular plant? You may want to take a more scientific approach and determine your specific soil needs. After all, soils and composts are all as different as the plants that depend upon them. That is where soil labs can help. Depending upon what your current soil conditions, some plants will ultimately require more nitrogen, or phosphorous or potassium macronutrients and some micronutrients at different phases of their growth cycle and on top of what a good base such as Be-1 can provide. Therefore, the next step is testing your existing soil or amendments to determine what more and when other inputs may be needed. 1. Test your existing soil (or compost/ compost tea) biology by taking a sample of soil and sending to favorite testing lab, such as our lab partner EarthFort. Typically, labs require a couple cups of soil/compost or 300 ml (10 ounces -or- roughly 1.25 cups) of liquid tea. They will look at your sample under a microscope and determine whether you have good balance of beneficial bacteria, fungi and especially protozoa. They actually count the number of microbes they see and catalog the type. A good lab will also be able to determine what macro- and micro- nutrients are already in the soil and how much. It's not about just making your grass greener. Many products can do that. Instead, think deeper and what microbes can do. 4. Figure out what plants you want to grow and be sure to tell the lab. Many labs have a benchmark database for optimal nutrients for your plant type. 5. Inform your lab that you will be using Be-1 pellets as your "base fertilizer." Direct them to the Be-1 data sheet and lab results on our webpage so they can assess what nutrients are included and how much the biology will increase. The lab will be able to take your current soil microorganism makeup, existing nutrients, your goals and the plants you want to grow to recommend amendments (if any) to Be-1 pellets. Earthfort typically charges roughly $108 per test. Taking it to the next level, you may consider a verification test after application of products to confirm your microbes and nutrients are performing as expected. The first year may be expensive, especially if ordering multiple tests, but then assuming the same input sources, you can switch to a periodic testing.